We’re quite proud of our kids’ gym here in Northbrook (and equally proud of our first expansion in Vernon Hills). If you’ve never been in, you might be surprised to see all of the interesting equipment and obstacles that we have lined up for kids’ birthday parties. Well, all you have to do is take a look at this video to see all of it in action and find out more about our birthday party venue. But you might be wondering how we came up with all of these obstacle courses. What was our inspiration, and why do kids enjoy them so much? Let’s find out! There’s no doubt that a big part of our inspiration comes from the NBC television show American Ninja Warrior. We admit it, we love the show! In fact, we wrote an entire blog about why just about anyone who watches it can find something to like about it. It’s exciting, it’s friendly, and you can you can really be inspired about what the human body can do. So why use it as inspiration? Because kids love it too, even if the obstacle courses used on the professional television program are only able to be run by adults. While only a small fraction of the population could ever compete on such a difficult course, we’ve brought it down to “kid scale,” making them not only smaller but also group-friendly. If you’ll notice, the American Ninja Warrior obstacle course is set up for one person at a time. Our courses not only get kids exercising while they’re having fun, but they also teach kids to work together as a team. In fact, some courses we put together can’t be solved alone, which teaches kids how to work together. Military obstacle courses have been around for a long time as a way to prepare troops for the conditions they might encounter. These were the original ropes courses, tire climbs, balance beams, and other types of obstacles that have inspired up here at Hot Ground Gym. In fact, both of our founders are ex-military, and they’ve certainly been through their share of military-grade obstacle courses. While our course might be hard, it’s not quite military-hard! No doubt about it: American Ninja Warrior is just a big playground for adults! We’re also inspired by playgrounds, because they’ve been created by companies that watch how kids play and develop them accordingly (and safely). So we grab some pointers from them in order to make our kid’s obstacle courses as fun as possible. The best thing about playgrounds is that kids are getting exercise without even knowing it. They might be exhausted after visiting our kids birthday party place, but they’ll probably be wanting their next birthday party here too! Hot Ground Gym has taken elements from all of these inspirations and made our own unique birthday party place that focuses on kids’ fitness. 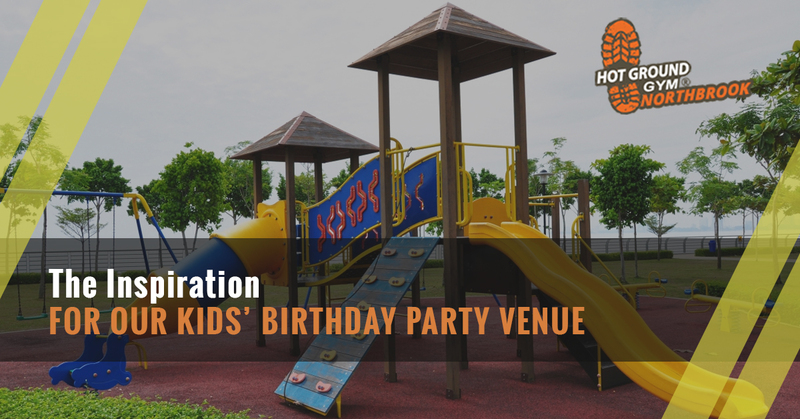 Learn more about our birthday party venue right here and sign up today!